A ceramic relief based on a work of Mr. Heihachiro Fukuda, an artist born in Oita Prefecture, has appeared at Oita Airport. 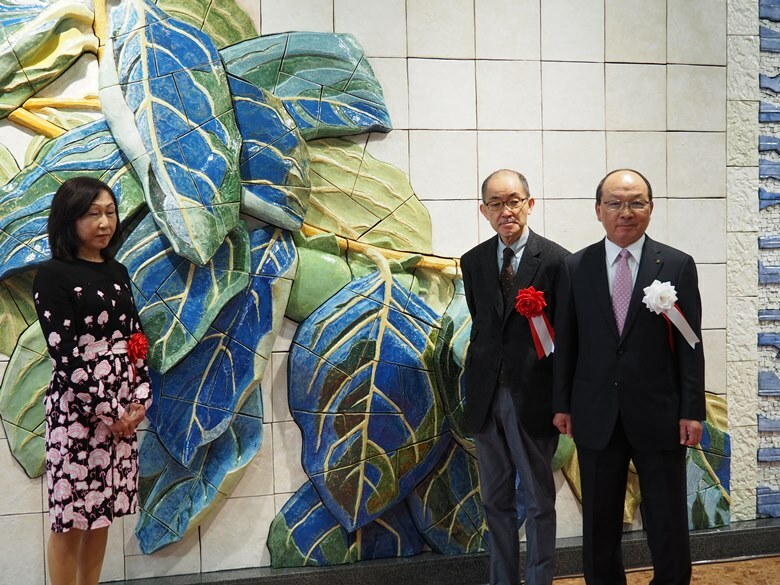 This ceramic relief “Heihachiro Fukuda’s Paean “Aogaki (Green Persimmon)” Resonance of Color and Shape” was installed on the departure lobby at 2nd floor of Oita Airport Terminal on March 5, and an unveiling ceremony was held. Mr. Tomomasa Futsukaichi, Deputy Governor of Oita Prefecture, Mr. Tomitaka Matsuo, President of Oita Air Terminal Co., Ltd. which manages the airport, Mr. Megumi Nishikawa, Executive Director and Secretary General of Japan Traffic Culture Association, which planned and produced the ceramic relief, and Mr. Shoichi Kono, Director of Japan Lottery Association, which gave a subsidy to this project, attended at the unveiling ceremony. Ms. Keiko Fukuda, a grandchild of Mr. Fukuda, who lives in Kyoto, also rushed there. Mr. Futsukaichi, Deputy Governor, said, “I am very happy that a relief of Mr. Fukuda from this prefecture has been installed at Oita Airport. I hope many people visit the airport to see this work.” After that, the unveiling took place. When a work of 2.75 meters in length and 9 meters in width appeared, a big applause came from attendees and travelers surrounding there. Mr. Tomitaka, President of Oita Air Terminal, gave a letter of appreciation to our association, and he said, “Last year we installed a footbath to enhance the appeal of the airport. This time, the ceramic relief was installed and new attraction was added to the airport.” He stated that he printed 10,000 copies of the brochure introducing this work which would be distributed to those who visit the airport to publicize widely. This ceramics relief was certified by the government “beyond 2020”.